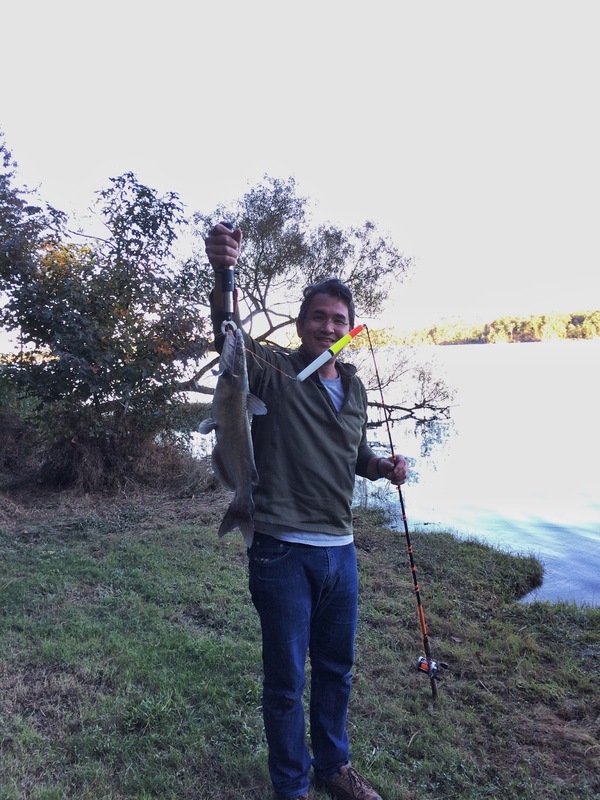 I mentioned in my previous post, that I caught a "personal best" catfish, so I figured I should post a picture. I didn't measure and weigh him, but I'd estimate about 25" and 5 or 6 pounds. Now, I know this is not very big by channel cat standards, but it's big for me and I was delighted to catch him! The past two weeks I've been fishing with my and my friends' children and my goal has been to make sure they caught fish, so I'd selected a nice little stocked pond in a nearby park. The channel cats in that pond are dinky (less than 1 lb), but there are a lot of them and the bites are plentiful. So everybody caught a lot of fish and the kids had a really good time. However, the pond sits near a big impounded lake so on Sunday afternoon, I returned alone to try my luck at landing some bigger cats. It was shaping up to be a total bust – I went 2 hours without even a nibble! I tossed out what I intended to be my final cast and finally got one. It was worth the wait. As soon as I set the hook I knew he was the biggest fish I'd caught to date. He gave up a great fight. I released him back into the water after the all-important photo, hoping he'd give somebody else a thrill one day. Then I packed up and went home with a nice memory, a photo, and a big dumb smile on my face.